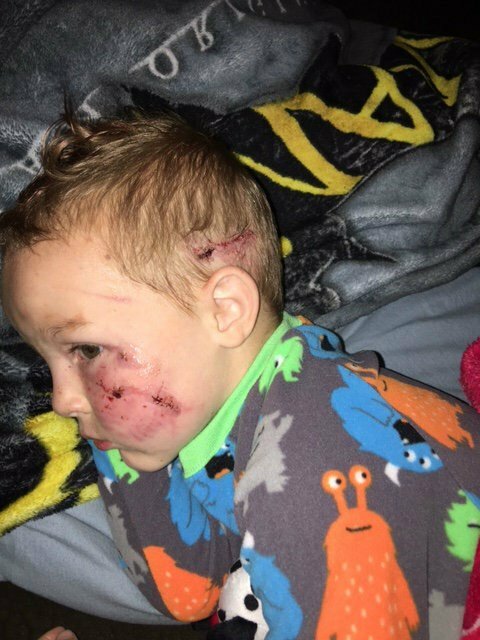 A Belgrade boy is recovering after being attacked by a dog over the weekend. 4 year old Brady Coates was playing with the neighbors’ granddaughter Saturday when a MINI AUSSIE attacked him. VIDEO - SHOWS WOUND ON TOP OF HIS HEAD!!! “I looked out the window and I saw it and I just dropped everything and ran out and grabbed him,” said Daiealee Coates, Brady’s Mom. Before Daiealee got to her son, the neighbor had stopped the attack, separating Brady from the dog. “If it wasn’t for my neighbor, though, I don’t know if Brady would be here,” said Coates. The dog had bitten Brady’s head. Emergency responders were called and he was taken to the emergency room and Bozeman Deaconess Hospital. “There are 12 different lacerations that were attended to, six on this side of his head. There’s one on the top that’s probably the worst - with 12 staples in it,” explained Coates. Brady is recovering, however he is having trouble sleeping because of pain from the injuries. Brady is also going to therapy to deal with the trauma of the attack. The dog who bit him is in a mandatory quarantine. The dog’s owner will face a judge in a few weeks. We’re told the dog will not be euthanized because this is its first offense. A Go Fund Account has been set up to help with financial losses and costs, click here to donate. Despite his name, the Australian Shepherd originated in the western U.S., not Australia, around the time of the Gold Rush in the 1840s. Originally bred to herd livestock, he remains a working dog breed at heart; the Aussie, as he’s nicknamed, is happiest when he has a job to do. He can be a wonderful family companion if his intelligence and energy are channeled into dog sports or activities. The "Mini" Australian Shepherd is a new, human engineered breed. They breed for tiny, abnormal Australian Shepherds. When people are selecting for size, in this case small and runty, they ignore important things like temperament. I have seen more than one "Mini" Aussie around with a reputation for being snappy. I've seen them in cars and trucks, when I walk by, they go fruitcake. Not at all the stable temperament of a normal size Australian Shepherd! These are deformed dogs bred for small size and not intelligence and good temperament. I'm glad I didn't buy one of these dogs. I was so infatuated with them. I agree that they are deformed. What is wrong with a normal sized Aussie?